My personal site. Rants and musings about politics, law, war and life in general. Catholic by birth, Buddhist by choice, Law School Graduate by hard work. Welcome. 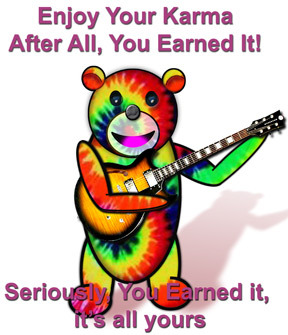 A Forum for the discussion of Guitar related information including theory, methods of playing, and featuring discussions about the Courses offered at Truefire.com - the premiere place on the web to find instructional material to make you a better Guitar player. 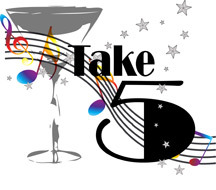 Meet new friends and enjoy a community of Guitar enthusiasts who are also willing to help you play better. There has been an excellent new Robbie Calvo course released - RhythmCraft. The One on One Sherpa classes are open so you can take personal guitar lessons with many TrueFire Instructors. I am taking a class with Ravi who has a number of TrueFire courses available for the beginning guitar player. Ravi's Learn Guitar in 21 Days is one. Find it here. 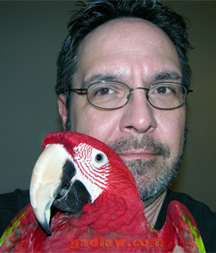 Here is a picture of Hiro the Greenwing Macaw and me. Every once in a while someone will email me with questions about Greenwing Macaws, what to feed them, how to treat them and train them and I'm happy to share whatever knowledge I have in that regard. Beautiful and intelligent animals that require a good deal of care so don't take on the responsibility lightly. The US Supreme Court rules in 1976 through two cases, Gregg v. George and Jurek v. Texas that a death sentence is not a per se violation of the 8th Amendment. In 1977 Gary Gilmore became the first person executed after the reinstatement of the Death Penalty. He was shot by a firing squad in the state of Utah. In 1979 John Spenkelink becomes the second person executed in 12 years. He is executed by the state of Florida and is electrocuted. The state of Texas executes Charles Brooks by lethal injection. The state of North Carolina executes Velma Barfield making her the first woman executed since the reinstatement of the death penalty. The Supreme Court rules that the Eighth Amendment is not violated by executing retarded people. The state of Washington executes Westley Dodd by hangning. First execution by hanging since the reinstatement of the death penalty. The state of Florida clears Frank Lee Smith posthumously after he spends 14 years on death row. He dies of Cancer in prison. My Death Penalty stuff is still available from the Menu. It hasn't been updated in a while so apologies for that. Death Penalty information. Statistics, inmates, victims. The Death Penalty debate. University of Dayton School of Law passings. Dean Conte, Andy Johnson. Dean Francis Conte passed away recently. It came as a shock to me when it was passed through the UD mailing lists. I remember him as a kind and caring individual who displayed a genuine concern for the students. He presided as Dean during the construction of the new Law School building. 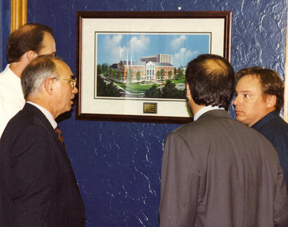 In fact the picture above shows a number of Professor's looking at the artist's rendering of the then future University of Dayton School of Law. This was either in 1997 or 1998 as I recall. Dean Conte passed away much too young and he will be remembered fondly by those who knew him. Above is a picture of Dwight 'Andy' Johnson. Andy died in a car accident a number of years ago and it was my honor to know the man. 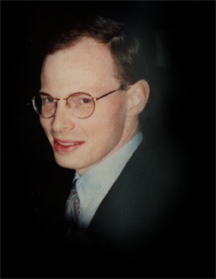 He was a cancer survivor and one of the folks who, like me, clawed his way to Law School and fulfilled a goal of his life by attending and graduating. He was a great and kind man without a evil bone in his body and he always had kind words and consideration for anyone and everyone. He was a great spirit and I think of him often. 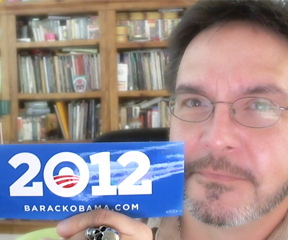 It's that season when thoughts turn toward screaming partisan politics. Republicans and Democrats are driving the country off the cliff as usual and the only way to fix anything is to vote the other party out of office. It's a pretty easy choice for me this time again, I can't see myself voting for any of the Republicans I see running cause they all have serious cases of the crazies. Whether they believe in Creationism or Magic Underwear or whatever it just seems to me that electing any of them would send us over the cliff all the more quickly. It's already ugly and it's going to get uglier. 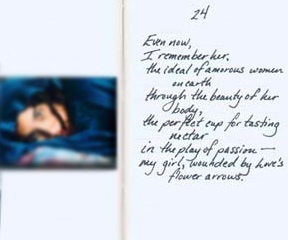 Now for beauty and poetry I would recommend Fantasies of a Love Thief by Bilhana. It's very hard to find a copy of this, I found one eventually by way of an online used book store. Here's the poem. 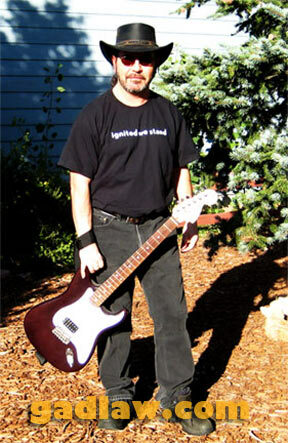 Me and my American Strat. I'm more of an Acoustic player. Like everything else, this is a work in progress. Any suggestions or comments feel free to politely let me know. The page scripts are designed by others than myself, I haven't been able to keep up with the changes and thank those who do. I have found a few of the 'social' websites on account of being involved with Truefire.com and their forum. I can be found here and here. Facebook and Twitter are easier to update and you'll find me there if you are curious to hear from me. Once upon a time when I knew everything I looked at the Telecaster and thought it was an ugly guitar and couldn't possibly be very good. After all, it didn't look attractive to me at the time so how could it sound good? Well, now I've come to the conclusion that I'm an idiot. 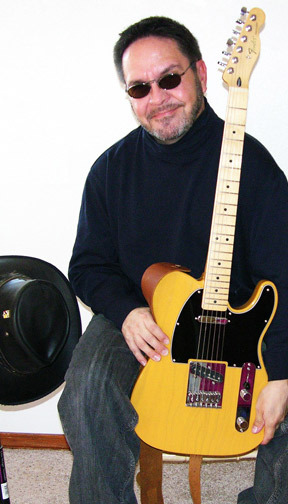 The Telecaster is now a beautiful, magnificent guitar which sounds great. It plays like a dream and is very comfortable. My favorite electric guitar most very suitable for the Blues and playing those Stevie Ray Vaugh licks or those licks from Jeff McErlain or David Hamburger. 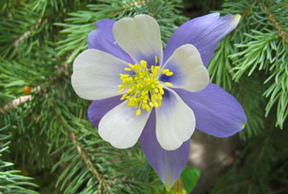 Below is a picture of a Columbine Flower, one of many I see when I'm hiking the mountains of Colorado. 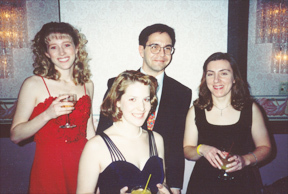 Me and a number of beautiful young ladies at the Barrister's Ball in Dayton lo these many years ago. I can't remember who was in which class, 98 and 99 were pretty close as I remember. Comes the month of May and more interest in me and my website. I've got my emails and mailings from Mr. Stonecash over at Dayton and site visits from around the country. It's always a surprise when someone from the past emails me and says hello. Hello back to you all. 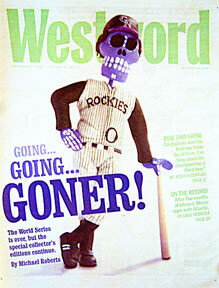 The Work of Jerry Vigil, author of Day of the Dead Crafts. A bit of video of him speaking can be found here.